View of a weaver’s cottage on the small island of Isay, in Scotland. The island is the most southerly of the Hebridean islands of the Western Highlands. In the 12th century Isay was the centre of a large kingdom ruled by the MacDonald Lords. Isay is 25 miles long by 20 miles wide and is well known for its historic distilleries. During the 17th and 18th centuries the weaving of textiles was a key activity in Scotland and hundreds of people were employed in cottage workshops weaving and creating tartan fabrics. 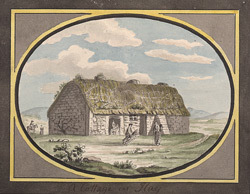 This water colour depicts a typical weavers cottage.